Following the dossier published by the Clapham Junction Action Group on the redevelopment of Clapham Junction station, Barry Sellers, Wandsworth Council officer, sent an answer on January 5th, 2012. We thank him for taking the time to address our queries and the opportunity to discuss the mater. The letter claims point 3 has been completed. Indeed there is a new entrance via Brighton Yard as we reported in May last year. The East London Line extension to Clapham Junction (1) should be completed by December 2012. 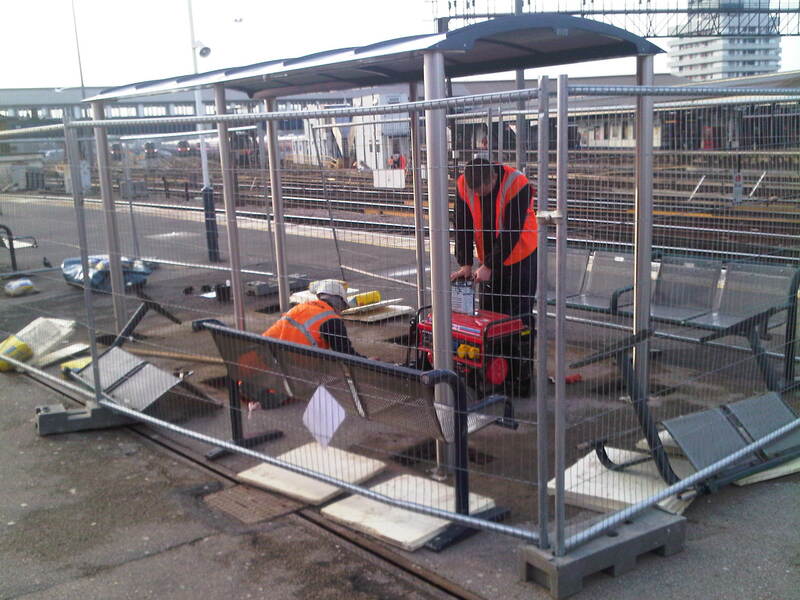 Works to accommodate the East London Line Overground Service from Surrey Quays is currently underway. We were told by other sources that changes to stairs became necessary to accommodate security regulation, which was not forecast in the initial plans. We are now told that the work also involves alterations to the Grant Road entrance to the station and a new lift to platforms 1 and 2 (current application 2011/5462). This is very good news, but we regret that instead of being properly planned and foreseen some years ago when NR and WBC started to think of the redevelopment of the station (as we were told that Delancey’s plan of Twin Towers was once-in-a-life-time opportunity and now or never! ), it was all rushed by the East London Line extension regulations. Instead of “patching” Grant Road entrance, why is there no plan to redevelop the entrance completely with a new hall? The letter elaborates also the progress on Airtack and Crossrail2 that we have already presented in a recent article. External growth presented in the dossier is of course related to the existing or planned proposals that raised for the last few years. It does not take into account hypothetic assumptions made by WBC in its Site Specific Allocation Document (SSAD) such as the re-alignment of Falcon lane as we have already demonstrated the uncertainty of the idea. Regarding improvement of St Johns Hill entrance, the letter point out the current changes made on the pavements by the Exemplar scheme, due to be completed (on this part) in 2012. We all agree that Clapham Junction is deserving of a building of architectural. However there is no answer or hint from WBC to promote any major improvement including a new main hall with a complete redesign of Clapham Junction Station. Instead it seems that WBC prefers to concentrate on smaller (thus more achievable indeed) goals on the short term, which they can claim credit for at the election term, without any consideration for a global vision on the longer future of Clapham Junction station (there is indeed no such word in the 10-point plan!). Although we appreciate the efforts made to improve the station, the current measures are only “patches” and we will continue to lobby the Council for a more ambitious proposal. You can read and download the full answer from Wandsworth Council HERE. Over the last 3 years, we have been supported by many local residents, associations and councillors who were keen to join us to express their concerns about Clapham Junction and particularly the station. In 2009, we have been involved in the campaign against the project to erect two 42 storey towers on top of the train station. With letters and petitions, we were supported by more than a thousand local residents expressing their objections to the proposal, but also their wish to redevelop the facility. We are concerned that our involvement should not just be reactive, but a positive contribution to any new development. Clapham Junction Station is currently the biggest junction in Europe. It is in a disgraceful state, a national scandal, and as such it should be treated as a priority. Money is, as always, the stumbling block but with the help of concerned people we may be able to inspire more imaginative thinking about the scope of the opportunity without resorting to skyscrapers to pay for it. For many months we have collected ideas and opinions, asking for residents and local stakeholders to participate and express their views, concerns and opinions on the future of our station. All comments have been published on the website (here) and area also available at the bottom of this post. We have now published the dossier of the Clapham Junction Action Group along with the Annex documents. All recent examples show that instead of having a vision for the future of the rail station, the authorities have always reacted to “patch” urgent and critical issues (congestion and overcrowding lead to the opening of Brighton Yard, capacity regulation forced an urgent workout on Grant Road side). All those problems were however highlighted by users and local residents for years. With the failure to achieve any redevelopment for Clapham Junction in the past decade, along with the lack of a global planning for any long term commitment, the situation will be exacerbated with passengers and services increasing. In an ideal world, a regeneration of the Clapham Junction area would consist of a fabulous new station complex on the site of the existing buildings South of the tracks on the model of Birmingham New Street. This would recognise the function of the site as a station, and allow a reasonable development of additional office and retail facilities without creating the eyesore of high rise residential blocks. The redevelopment of Clapham Junction station is Network Rail’s responsibility. The site should easily justify such a development based on passenger numbers, and we believe that this should remain our aspiration. Over the last 14 months, we have been supported by many local residents, associations and councillors who were keen to join with us expressing their concerns about Clapham Junction and particularly the station. We have already met with directors from the Office of Rail Regulation and senior managers from Network Rail (meetings organised by MP Martin Linton), who will be responsible for delivering any improvement project to redevelop the station. Within the next two years, these bodies will determine the funding allocation up to 2020. We are concerned that our involvement should not just be reactive, but a positive contribution to any new development. 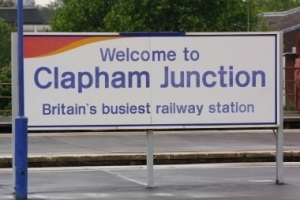 Clapham Junction Station is the biggest junction in Europe. It is in a disgraceful state, a national scandal, and as such it should be treated as a priority. Money is, as always, the stumbling block but with the help of concerned people we may be able to inspire more imaginative thinking about the scope of the opportunity without resorting to skyscrapers to pay for it. Although many statutory, political and business forums will be consulted before any plans are drawn up, this is an opportunity for local residents to have their say. Would you welcome a new station building on the site of the current Stop Shop and adjacent buildings, and if so, should it make a landmark for Clapham Junction or seek to blend in with the current style of buildings in the area? If taller buildings are to be included in the development to make it viable, how tall should they reasonably be? What suggestions would you make for improving access between St John’s Road and Grant Road and the station platforms in between? Should the current underpass and overpass be retained and how could they be enhanced? Should further overpasses/underpasses be added? What is your vision for the entrance of Grant Road? St John’s Hill? Should the redevelopment concentrate on the station buildings solely or include destroying the adjacent building to redesign the full area? How much shopping do you think should be made available in any development and should space be made available for office businesses? What should be done to improve access to the station across and along the busy roads around? What prime conditions should be addressed for any redevelopment of the station? We would be happy to collect the views of the community to make a case to Network Rail (an example of the dossier that could be presented with your contributions is available here in PDF). Clapham Junction Station is the busiest train interchange in Britain and is used by 19.8 million recorded passengers per year starting or finishing their journeys at the station (not including changes between trains, which increases the figure to 36.57 million passengers). There is a 30% planned growth by 2026. Passenger congestion is already a major issue during the am and pm peak travel periods. Passengers using the St John’s Hill ticket hall are regularly affected by congestion. Grant Road provides an unwelcoming approach with adjacent derelict and boarded up buildings and the entrance is closed at 11pm. The subway experiences severe congestion during the am & pm peak flows and throughout much of the day. The current congestion levels at Clapham Junction, both on platforms and inside the station, are in need of long term sustainable solutions. Frequency of overground services to Willesden Junction to be increased to 4 trains/hour . Phase 2 of the East London Line extension, running from Clapham Junction to Docklands [May 2012]. New rail link from Heathrow Airport to Waterloo. 2 services an hour stopping at Clapham Junction . Cross Rail line 2 . Additional funding announced by the Transport Secretary: £10m. Projects to be decided. Platform lengthening and straightening at [£20m] Cancelled as NR considered it is no longer necessary! We list below with dates the contributions we received. This list will be updated a.s.a.p. with new contributions.